The Blue Ridge Parkway is one of the Southeast’s most treasured resources. From end to end it carves a 469-mile path along the spine of the Blue Ridge, acting as a regional corridor for outdoor adventure. At its highest point—south of Waynesville, North Carolina near the imposing summit of Mount Pisgah—the parkway climbs to an elevation of 6,053 feet. At its lowest, as it follows the course of Virginia’s James River, it dips to a mere 649 feet. 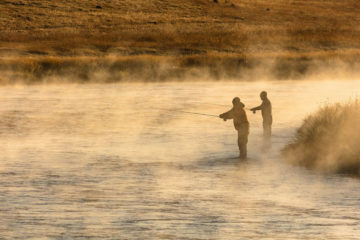 Fly fishermen know the value of the parkway better than most. 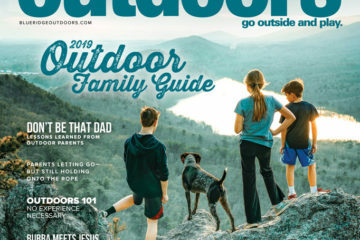 For years savvy anglers have used this two-lane scenic byway to connect the plethora of mountain streams that dot the Blue Ridge landscape. 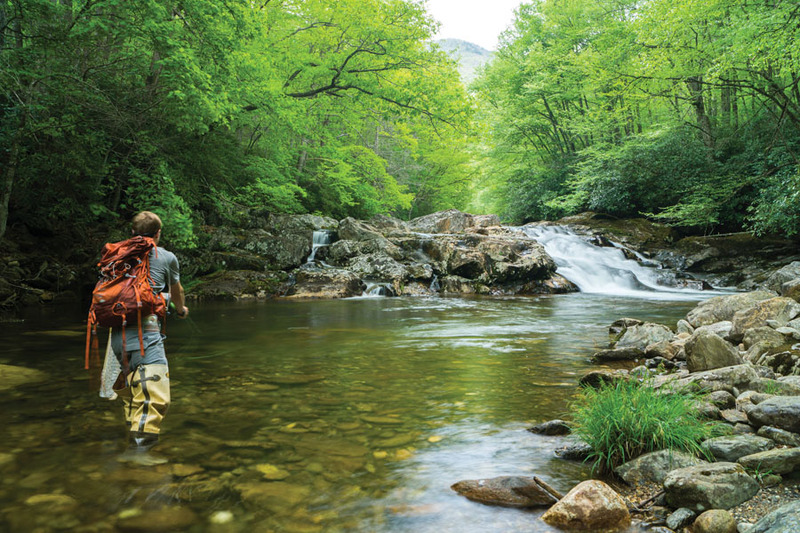 Next time you head to the mountains with a 5-weight in tow, use this guide to fly fishing the Blue Ridge Parkway to help you along the way. Whether you’re heading north toward Skyline Drive or south in search of trophy browns and rainbows at the parkway’s southern end, it’s sure to serve you well on your quest for the ever-elusive southern trout. 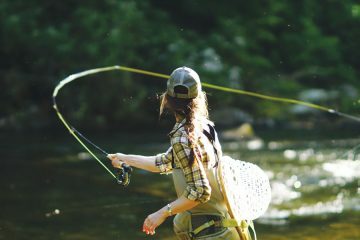 Accessible via the far southern end of the Parkway and situated in the heart of the Cherokee tribal lands, the Cherokee Trophy Waters offer one of the most unique fly fishing experiences in all of Appalachia. 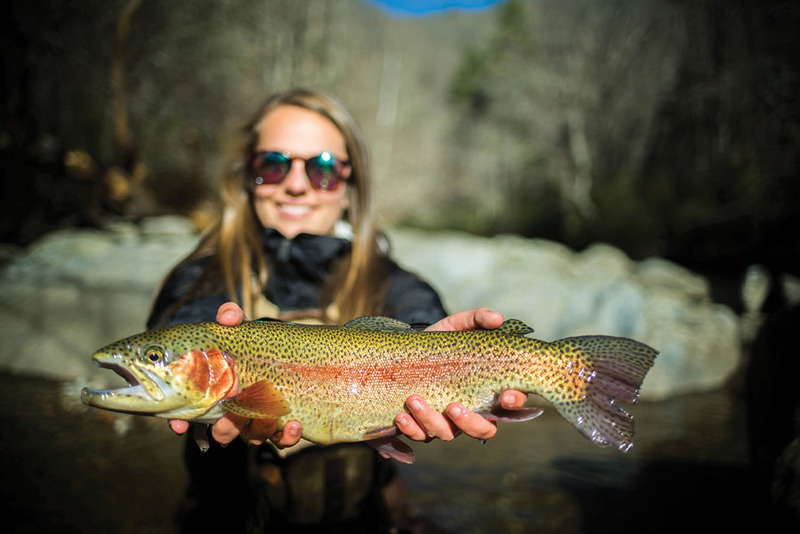 This network of heavily stocked tribal water features stretches of the Oconoluftee and Raven Fork Rivers, both of which harbor some of the biggest trout in the Smoky Mountains. Anglers fishing these waters routinely net rainbows and browns measuring twenty inches or more. The secret to these trophy trout waters is savvy management. A stretch of the Raven Fork, beginning at the Parkway and extending north for 2.2 miles, is heavily stocked and regulated by strict catch-and-release policies, and a portion of that 2.2 miles is set aside for fly fishing only. When to go: Avoid the summer crowds and visit the Cherokee trophy waters sometime between fall and spring. What to use: Make sure you’re packing heavy tackle designed to take on larger fish. A 9 foot 5 weight rod is recommended. If you’re seeking remote wild trout waters, look no further than the East Fork of the Pigeon River. Also known as the Big East Fork, this pristine waterway flows through the heart of the Shining Rock Wilderness with gin-like clarity. Paralleled at points by the Blue Ridge Parkway and accessible by the Big East Fork Trail, this stretch of wild water houses some rainbows but is primarily known for its brook trout, Southern Appalachia’s only native trout species. Notable tributaries include the Yellowstone Prong, the East Fork Pigeon, the West Fork Pigeon, and Dark Prong. 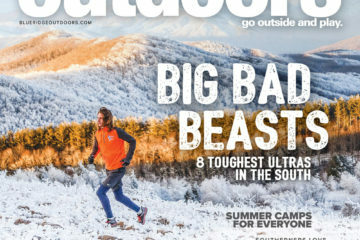 When to go: The Big East Fork sits at a relatively high elevation. As a result, winter water temperatures are too low to support active trout. Concentrate on the East Fork from mid-April to October. What to use: Focus on flies like small hoppers, Parachute Adams, and Prince Nymphs. Originating on the northern slopes of Mt. Mitchell, the Eastern country’s tallest mountain, the South Toe should be on every parkway angler’s short list. It is directly accessible from the Blue Ridge Parkway via Forest Road 472, and its lower reaches have been compared to the highly acclaimed and Blue Ribbon-rated Davidson River. Anglers who venture onto the South Toe will be afforded the opportunity to land feisty rainbows, browns, and brookies in the six- to ten-inch range. One aspect that sets the South Toe apart are the numerous campsites located along its banks. With several first-come first-serve sites along Forest Road 472 and established sites with amenities in the nearby Black Mountain Campground, the South Toe is the place to go if you’re looking to set up a trout fishing base camp in close proximity to the Blue Ridge Parkway. Also nearby and worthy of exploration are the South Toe tributaries of Upper Creek, Lower Creek, Big Lost Cove Creek and Rock Creek. When to go: Winter fishing is tough on this stretch of water, both because this portion of the parkway tends to be closed during colder months and because trout seem to go dormant at these higher elevations. Concentrate on this stream from late March to early November with an emphasis on the spring months when the best fishing should be in full swing. What to use: If you’re lucky enough to hit the spring hatch, pay close attention and try to match accordingly. Caddis and stonefly imitations will usually do the trick. Summer means terrestrials like beetles, hoppers, and flying ants. Commonly listed among North Carolina’s top-ranked trout streams, Wilson Creek is just one of the several great fisheries located in the Catawba Drainage. But if you’re looking for something in the Western North Carolina High Country that is easily accessible via the Blue Ridge Parkway, it is among the absolute best. One of the few rivers on our list afforded a Wild and Scenic designation, Wilson Creek harbors brown and rainbow trout in a variety of pools, runs, and riffles and has been compared to the streams of Northern California’s Sierra Nevada. While you’re in the area, don’t miss out on the chance to fish Harper Creek, Gragg Prong, and Lost Cove Creek—all tributaries of Wilson. When to go: This stream is highly fishable in the spring and fall months, but may also yield trout in winter if you’re persistent and happen to catch one or two unseasonably warm days. What to use: Stock your box with streamers when fishing the lower sections and consider basic dries with nymph droppers when fishing the higher altitude sections. The width of the Watauga and the openness of its banks as it flows through Valle Crucis separate this river from its Southern Appalachian counterparts. More reminiscent of the type of rivers found out west than those typically located in the Blue Ridge Mountains, the conditions found on this stretch of water are considered a welcome respite for the rhododendron-weary fly fishers among us. 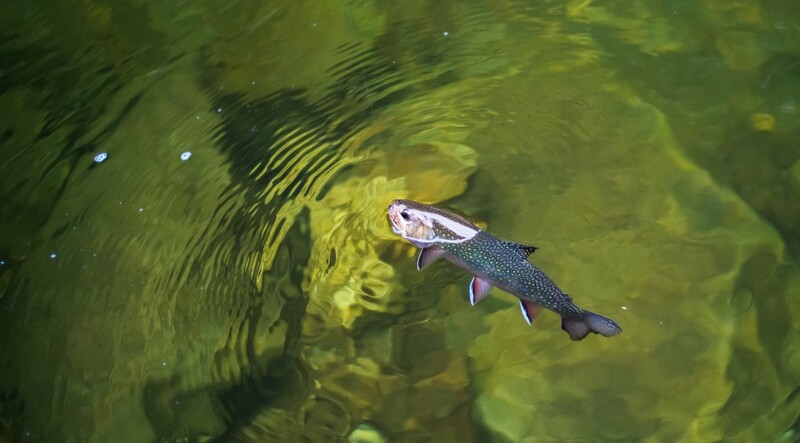 In Valle Crucis you’ll find ample public fishing access leading to rainbows, browns and the occasional brookie. From October 1 to June 5, this portion of the Watauga becomes a designated Delayed Harvest stream, which means all netted trout must be released to fight another day. When to go: Early fall to mid-May offers the best window of opportunity for Valle Crucis-bound anglers. What to use: San Juan worms are a popular choice as well as streamers, nymphs, and traditional dry flies. Often heralded as the best trout stream in Shenandoah National Park, the Rapidan has long been famous for its fly fishing potential. A former haunt of President Herbert Hoover, this river offers anglers a true native trout fishing experience. It mainly houses wild brookies, usually within the six- to twelve-inch range. Pools here plunge as deep as eight feet and can rival a small living room in size. Certain sections of the Rapidan can be accessed by downhill trails extending from Skyline Drive, while access to the lower section, known for producing the best hatches, is granted via Route 662 through Wolftown and Graves Mill. When to go: For best results, try to catch the Rapidan during the spring hatch. 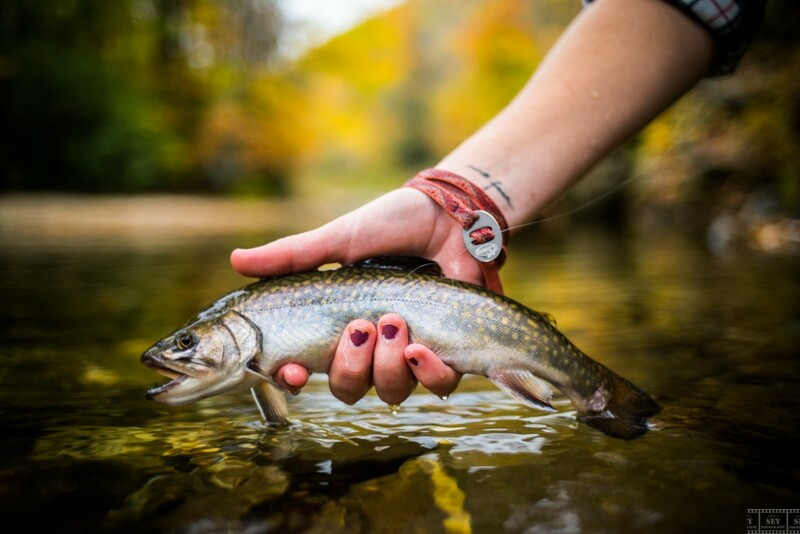 What to use: Its brook trout are known for their willingness to tackle a dry fly, so pay attention to your surroundings and try to match the bugs emerging from the surface. 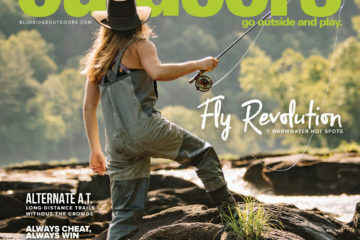 It would be ill advised to take a trip to the Rapidan without a few of the river’s namesake bugs, a small rusty colored dry fly known as Mr. Rapidan. The Moormans River flows into Charlottesville Reservoir, providing the Blue Ridge town with essential drinking water, but the North Fork of this river, where it flows out of the Blue Ridge Mountains in Shenandoah National Park, is better known for its trout producing potential. A catch and release only stream, the North Fork Moormans is wholly contained by the boundaries of Shenandoah National Park. Like the Rapidan, the North Fork provides prime habitat for native brook trout, but sizable browns are not uncommon. Accessing the North Fork is easy. Just head up Skyline Drive and park at the Blackrock Gap parking lot south of Milepost 87, then hike down North Fork Moormans River Road which runs alongside the river. You’ll find an ideal spot soon enough. When to go: Because it is a wild flowing freestone stream, the North Fork reaches low levels in late summer and early fall, making fishing more difficult. Try to avoid periods of low flow and focus your efforts on springtime fishing, when the North Fork is at its absolute peak. What to use: Make sure your fly box is stocked with dries like Parachute Adams and Elk Hair Caddis, plenty of bead heads’ nymphs, and terrestrials such as beetles and ants. The only stream on our list accessible by way of the Appalachian Trail, Jeremy’s Run is as much about the hike that gets you there as the trout you’ll hopefully land once you arrive. The fish here are small, wily, and wild, and when conditions are right, they’re eager to take a well presented dry fly or nymph. The most convenient access point for Jeremy’s Run is the Elkswallow picnic area near mile marker 22 of Skyline Drive. When to go: Both the remote nature of this stream and the diminutive size of the wild brookies that call it home make Jeremy’s Run an ideal setting for testing out lighter tackle. What to use: Take a 4 weight rod with you or a light Tenkara setup, and make sure to pay close attention to water levels. During long dry spells this small mountain stream is known to run low, making fishing difficult in certain areas. Like the Rapidan, the Rose River of Madison County is largely contained by the boundaries of Shenandoah National Park and accessible by the Blue Ridge Parkway’s northern cousin Skyline Drive. The Rose flows out of the Blue Ridge into the picturesque Rose Valley where it supports a hardy population of brookies and rainbows in the shadow of Old Rag Mountain. The section within Shenandoah National Park is open to the public, but beyond that is a stretch of private water owned and managed by Rose River Farms where anglers routinely land trout in the 17- to 20-inch range. When to go: With spring just around the corner, the time to hit the Rose River is now. What to use: Relatively light tackle is recommended and fly boxes should be fully equipped with #12 and #14 Quill Gordons and March Browns, as well as elk hair caddis, Mr. Rapidans, Blue Wing Olives, and Harry Murray’s elk hair beetles. The largest stream in Shenandoah National Park, Big Run is remote and wild, but it’s also home to some of the park’s biggest brook trout. To reach Big Run, park at the Doyles River parking area just south of mile marker 81 on Skyline Drive. Follow the Big Run Loop Trail from the Big Run overlook roughly 2.2 miles until you reach the Big Run Portal Trail. Take some time to explore upstream from the portal. Some of the better trout waters can be found near the section where Rocky Mountain Run joins Big Run from the north. If you’re really looking to immerse yourself in the area, bring your backpack along. Of all the streams on our list, Big Run may be the best candidate for a multi-day backcountry fly fishing excursion. When to go: While fishing on Big Run is best during the months of April and May when insect hatches are in full swing, it is one of those rare streams where anglers often find year-round success. Warm winter days are known to produce trout, while the stream’s steep gradient and deep plunge pool keeps the water cool and productive even in the heart of summer. What to use: If you’re going there in the next few months you’ll want to stock your dry fly box with quill gordons, American march browns, eastern pale evening duns, little yellow stoneflies, and cinnamon caddis, just to name a few. The Madison Run is best fished on its lower and middle sections where it flows between Austin and Furnace Mountains. It is accessible via Skyline Drive by parking at the Brown Gap parking area near milepost 83 and hiking down Madison Run Road, but most anglers choose to fish it from the bottom by way of Route 708. This access route requires less hiking and deposits anglers on fishable waters much more quickly than the Skyline Drive option. When to go: It’s best to avoid this stream when water levels are low, usually during the early fall and summer. Focus instead on spring, the best time to fish the Madison Run, and late fall. What to use: The brook trout in this quiet freestone are relatively easy to fool with well presented nymphs or standard attractor dry flies.